Following in the footsteps of the folks who tell the world about their conversations with gods come the theologians; it is their role to rationalize and intellectualize what the “great and wonderful” seers have announced—and they tend to be a tedious bunch. I have read far more of the Christian theological output than I care to admit, and the most common notes I have scrawled in the margins are, “How does he know this?” “How do theologians learn to talk like this?” “Theobabble!” You gotta endure a lot of brain hurt. It is a major misfortune when seer and theologian are combined in the same person, especially when that person is unhinged. The evidence for this calamity can be found in the New Testament letters of the apostle Paul. “He was a man who was fighting himself and quarreling with himself all the time; and he managed to project the warfare in his own breast onto the Cosmos itself” (A.N. Wilson, Jesus). During the course of this year I have been posting articles here about each of the chapters in Paul’s Letter to the Romans; with this post we are up to Chapter 11. This chapter has prompted considerable scholarly debate about the makeup of the Christian congregation at Rome when Paul composed this letter—were they primarily Gentile or Jewish Christians? Paul discusses just how these two factions can understand how they fit together. “What could more boring?” you may ask—and why should we care anyway? But Christian theologians are confident that the Mind of God can be plumbed by grasping every last nuance of Romans; it is the charter document of the faith. Martin Luther urged Christians to memorize it, and in 1932 scholar C. H Dodd called it “the first great work of Christian theology.” In his 1000-page commentary on Romans, Douglas Moo devotes 57 pages to Chapter 11. “We need to recognize,” he claims, “that Romans is God’s word to us and read it seeking to discover the message that God has for us in it” (p. 22). Serious thinkers, who can recite the multiple flaws of the revealed-word-of-god claim, stand in awe of this gullibility. Why should we take Paul’s theobabble seriously and analyze it syllable by syllable? Because God is lurking beneath this text—really? The 11th chapter of Romans sheds light on Paul’s delusion; he knows so much about how God and tells his readers how God plays Jews against Gentiles. And a few of Paul’s sentences here drive home the point that his theology was pretty grim. This charter document of the faith does not move Christianity beyond the vindictive God of the Old Testament—despite all of the hype to the contrary. Paul was sure that God’s default emotion was wrath. This is hardly a surprise since Paul was, as he points out at the start of this chapter, “an Israelite, a descendant of Abraham, a member of the tribe of Benjamin” (v. 1). In other words, he belonged to the ancient Yahweh cult, which was devoted to a scary, vindictive god. Moreover, he saw the cosmos as the plaything of that deity, who had chosen one specific tribe—the descendants of Abraham—as his favorite. This god had literally laid down the law: exactly what people had to do to keep him in a good mood. This prompts Paul to speak of the chosen few that will survive in his own time: “So too there is a remnant, chosen by grace.” The concept of free will, by the way, takes a hit when he quotes Isaiah 29:10: “God gave them a spirit of stupor, eyes that could not see and ears that should not hear, down to this very day.” It seems that God plays a role in leading people to sin. “Just as you were once disobedient to God but have now received mercy because of their disobedience, so they have now been disobedient in order that, by the mercy shown to you, they too may now receive mercy” (vv. 30-31). And then this startling bit of bad theology: “For God has imprisoned all in disobedience so that he may be merciful to all” (v. 32). So among other things, God is The Supreme Manipulator. I suspect that most of the faithful who fill the pews on Sunday mornings would reject this. They want The Man Upstairs to be a benevolent figure, their Cosmic Buddy—a great and wonderful wizard. They don’t read the tedious theological tomes that I referenced earlier. Neither do they read Paul’s letters—other than to slog through the New Testament on the chapter-a-day plan. 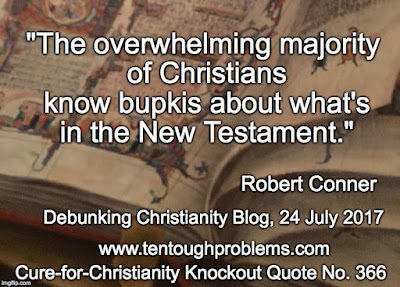 As Robert Conner has said, “The overwhelming majority of Christians know bupkis about what’s in the New Testament “ (in a post here on 24 July 2017). Paul’s god will preserve the remnant, those who confess that Christ was raised from the dead, and everyone else in the world be damned—literally. When the Son of Man comes—so says Matthew’s Jesus (24:37-38)—the suffering will be worse than at the time of Noah…when everyone on earth—except a very tiny remnant—died. 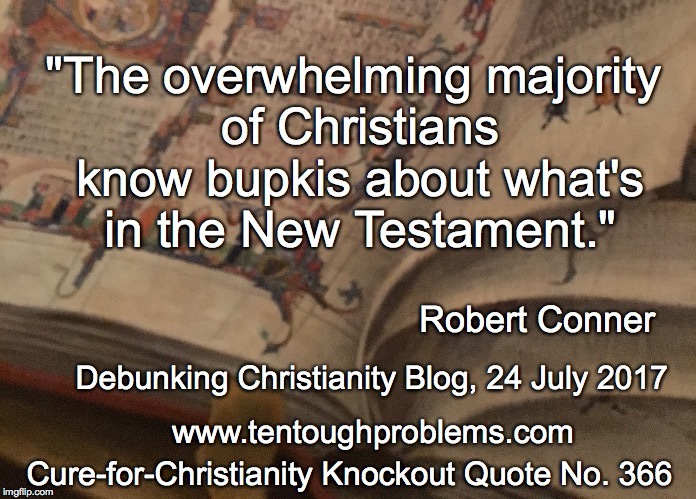 Truly, there is a nasty, get-even god prowling the New Testament as well as the Old. And Paul’s biggest fans, mean-spirited evangelicals today, who can’t wait for God to get even with sinners, smugly point out that those who don’t accept Christ are just outta luck. John 3:16 states the gimmick bluntly: whoever believes in him gets eternal life. Old Yahweh didn’t terminate those seven thousand who refused to bend the knee to Baal or kiss him on the mouth—Yahweh was mollified by their loyalty. This verse resonated with Paul because he liked a god who tempered his wrath with mercy for a few; and because he too was focused on recruiting a remnant—those whom he could bring to Jesus in time. Please let Paul’s talk about “a remnant” sink in. With his passionate preaching he knew that he was rounding up the few who would survive on the day that Jesus finally showed up. Most Christians don’t read the Letter to the Romans; it’s the first major bog-down point in the New Testament. But I wish they would….carefully. How can discerning believers not be turned off by some of its alarmingly bad theology? Paul’s god fails the decency test.